Premier B side Skeliga Fc proved to strong for Division 2B side CS Abbeydorney on Saturday night in Cahersiveen . Sean Cournane scored twice for Skeliga Fc with Anthony Cournane and Niall Brennan getting one each . Damien Ryall was the CS Abbeydorney goal scorer. Division 1B side Athletico Ardfert defeated Division 1A side Castlemaine United on Sunday morning to book their place in the last sixteen . Rattoo Rovers came out on top in the north Kerry derby against Asdee Rovers on Sunday. Brian Carroll and Aidan Boyle both scored two each with Kevin O’Connor getting one for Rattoo Rovers. Listowel Celtic B and Annascaul/Inch will have to do it all over again after an eight goal thriller on Sunday afternoon in Listowel. Eddie Joe Walsh and Brendan Angland were among the scorers for Listowel Celtic B.
Skeliga Fc 4-1 CS Abbeydorney . Castlemaine United 1-2 Athletico Ardfert . Asdee Rovers 1-5 Rattoo Rovers . Listowel Celtic B 4-4 Annascaul/Inch Fc . 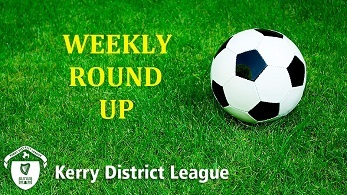 Dingle Bay Rovers extended their lead at the top of Denny Premier A with a win over Tralee Dynamos on Friday night. Sean O’Connor, Sean Fitzgerald, Joe Sheehy and Gareth Hickey Brosnan all got on the score sheet for Dingle Bay Rovers. Killarney Celtic are up to fourth place with a home win over Mastergeeha on Friday night. Peter McCarthy scored twice for Killarney Celtic with Stephen Hayes and Conall Murphy getting one each while Derry Ahern was the Mastergeeha scorer. Fenit Samphires moved back into second place with a narrow win over Killarney Athletic on Saturday night. The only goal of the game came from Sean Ryan. Dingle Bay Rovers 4-0 Tralee Dynamos . Killarney Celtic 4-1 Mastergeeha Fc . Fenit Samphires 1-0 Killarney Athletic . Inter Kenmare in third place closed the gap on the teams above them with a win over second placed Castleisland B on Sunday afternoon. Mark Granville and Caollan Coakley were the scorers for Inter Kenmare. Castleisland B 0-2 Inter Kenmare . Killarney Athletic moved of the bottom of the table with a win over St Brendans Park B on Sunday morning. Shane lynch and Dylan Hayes were the scorers for Killarney Athletic B . Third placed QPR defeated second placed AC Athletic on Sunday evening to close the gap on the two teams above them. Paul Cooney scored twice for QPR with Stephen Goggin scoring for AC Athletic . Killarney Athletic B 2-0 St Brendans Park B .
QPR 2-1 AC Athletic . AC Athletic B and Ballyheigue Athletic couldn’t be separated on Sunday at Mounthawk Park where Fergus Carroll scored for AC Athletic B and Kevin Walsh scored for Ballyheigue Athletic . AC Athletic B 1-1 Ballyheigue Athletic . Windmill United took another step towards securing a place in the league final with a win over Tralee Bay Fc on Sunday. Brian Hehir scored twice for Windmill United with a goal each coming fro Neill Barry , Eoin Greaney , Paul o Sullivan and Luke Ready . Abhann Li are up to fourth place thanks to a win over Ballyheigue Athletic B on Sunday. Armstrong Adado scored a hat trick for Abhainn Li while Mike Leen and Fionn Kavanagh scored for Ballyheigue Athletic B.
Mitchels Avenue B team remain in sixth place with a win over Lixnaw Celtic on Sunday in Mounthawk Park where Seun Osinubi and Declan Hickey scored the goals for Mitchels Avenue B.
Inter Kenmare B picked up their fifth league win of the season against second placed Strand Road on Sunday. The only goal of the game came from Daniel Taylor . Tralee Bay Fc 0-6 Windmill United . Abhann Li 3-2 Ballyheigue Athletic B .
Mitchels Avenue B 2-1 Lixnaw Fc . Inter Kenmare B 1-0 Strand Road Fc . Classic Fc closed the gap on the leaders Killarney Athletic with this win on Wednesday night . Eoin O’Mahony , Tommy Sheridan and Eddie Lacey were the Classic Fc scorers . Classic Fc 3-0 Killarney Athletic . Ballyhar Dynamos and Dingle Bay Rover swill have to meet again to see who will advance to the semi final of the Dominos Pizza U17 Cup. Patrick O’Connor scored for Ballyhar Dynamos with Mark Ashe scoring for Dingle Bay Rovers B .
Ballyhar Dynamos 1-1 Dingle Bay Rovers . Killarney Celtic secured their place in the quarter final of the Dominos Pizza U17 Cup with a win away against Killarney Celtic on Monday night. Dillon Daniels and Jason Griffin scored for Castlegregory Celtic with Jake Daly scoring for Killarney Celtic. Killarney Celtic 1-2 Castlegregory Celtic . Killarney Athletic are into third place with a win away against St Brendans Park B team on Saturday. Luke O’Donoghue scored twice for Killarney Athletic with Ryan Casey getting one. St Brendans Park B 2-3 Killarney Athletic . Listowel Celtic maintain their place in third position with the aid of a walkover form AC Athletic. St Brendans Park secured the second semi final spot with a draw against 1st placed Fenit Samphires on Saturday in Mounthawk Park. Gary Howard and John O’Brien were the St Brendans Park Fc goal scorers . Listowel Celtic Fc 3-0 AC Athletic , walkover . Fenit Samphires 2-2 St Brendans Park Fc .